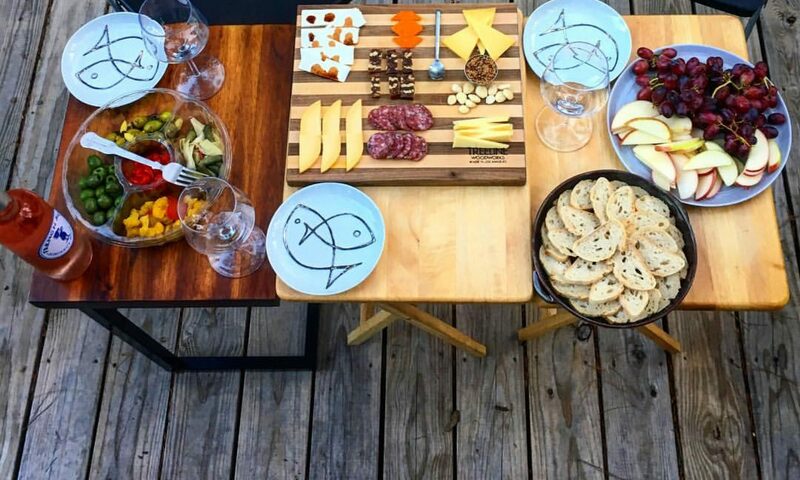 Last summer, when I went to visit my friend Amy in DC, I was stuck with the conundrum facing many travelers – how do I eat healthfully on the go? When I’m driving, it is easy (well, easier) to find a place to stop with healthy options but flying is a whole separate challenge. Airport food is expensive and let’s face it, no one has time to wait in line when they are completing the Atlanta airport sprint. Also, you can bring liquids or gels, which rules out my usual breakfast items of yogurt and oatmeal. To solve my travel conundrum, I packed a variety of healthful snacks in a small lunchbox with an icepack so I would have yummy food on hand and not be tempted by expensive, unhealthy airport food. I was a little bit worried about going through security, but the TSA didn’t seem to mind my lunchbox/icepack (nestled safely in my carry on) at all. Since my flight was leaving really early on Friday morning (like 8:00 which meant I had to be at the airport at 7:15) I had pre packed breakfast: an almond butter and honey sandwich with a banana on the side (sorry, no picture). I wrapped the sandwich in foil and place the banana on the top of my carry on and just hoped they wouldn’t get squished going through security. Rather than spend money on bottled water, I brought a reusable water bottle and filled it up after I got through security. The first flight to ATL was quick so I didn’t need to dig into my snack stash. 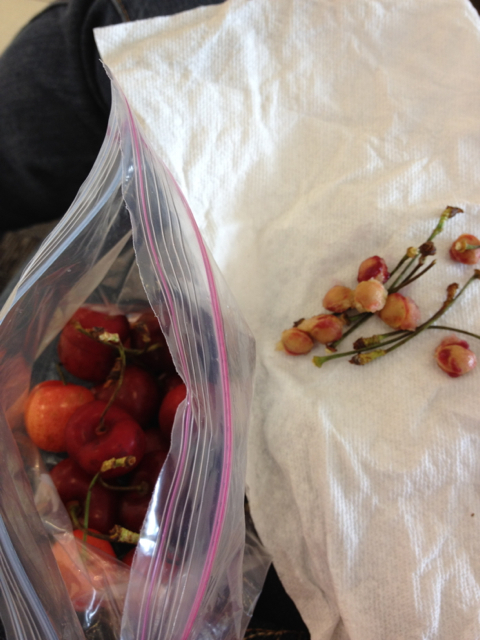 During my layover, I enjoyed some cherries while reading my book. 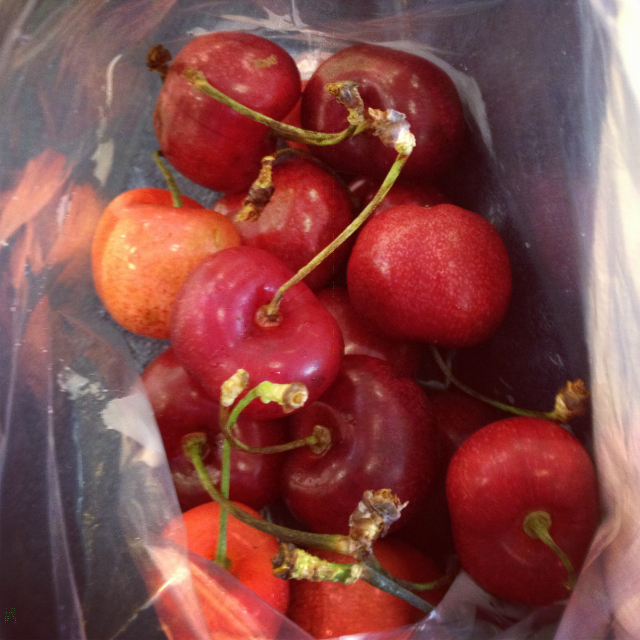 The one challenge with cherries is dealing with the pits. I just spit them out discreetly into a napkin and then threw them away when I was finished. Easy as that. 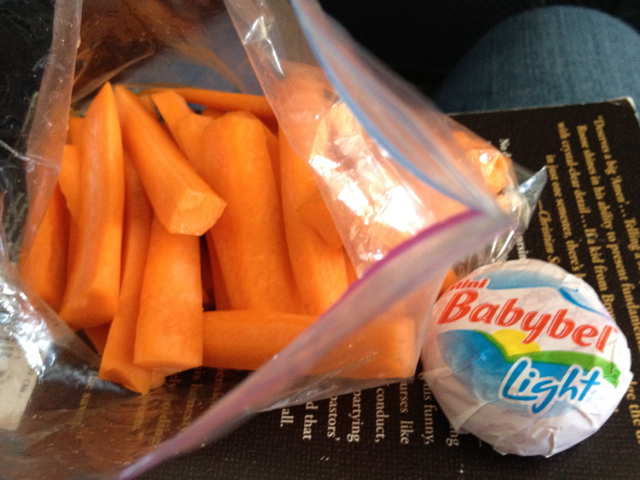 On my second flight, my tummy started to growl, so I quieted it with carrot sticks and a mini cheese wedge. Toward the end of my travels, I was hungry for lunch but didn’t want to spoil my appetite so I savored a few squares of white chocolate (also no picture but they were from an organic bar and so delish). I made sure to pack a few granola bars and an apple – sturdy snacks that didn’t require refrigeration and I could pull out if I really needed it. Thankfully on this trip, I didn’t. So there you have it. Other good snacks to pack would be peaches or other stone fruits, crackers, fruit leather, almonds or other nuts, instant oatmeal packets (get hot water from a coffee shop), and graham crackers. The goal is to make sure there are healthy foods including fruit/veg, dairy, fat, and complex carbohydrates to keep hunger at bay and fuel the happy, healthy traveler. Happy travels!